It should come as no surprise that I have finished the Shadow Children series. They are written for a somewhat younger audience than myself and are rather short books to begin with, so of course I read them quickly. They were also rather compelling and well written, so I definitely enjoyed getting caught up in a new to me series for awhile. 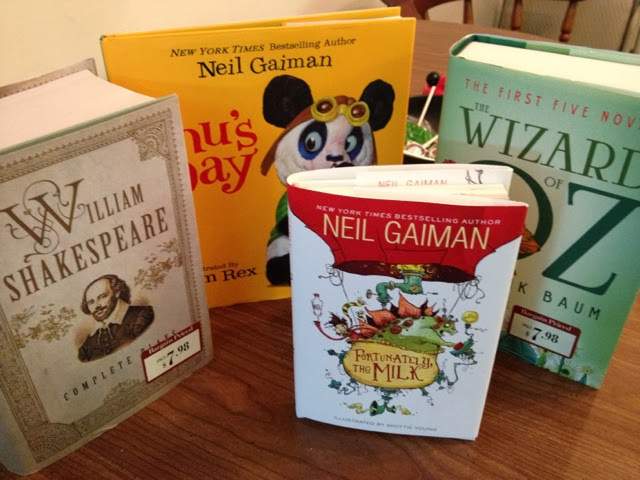 What might be a surprise is that two weeks ago I bought a new Neil Gaiman book (Fortunately, The Milk) that I haven't read yet. Even I'm not sure why I haven't yet. Just been doing other things I suppose. I really don't have a rhyme or reason to what I tackle next on my to be read list. It just depends on my mood or reading energy level (young adult or middle grade fiction is much easier to read than much adult non-fiction, for example) or what's available when I'm looking for something new. If I'm just reading for fun, it's going to be something I want to read and that changes based on all sorts of factors. It's not like I'm trying to prove myself to anyone, so I'll read what I like when I like, thank you very much. If it fits into some sort of reading challenge parameters, like the A-Z challenge I am so close to finishing? Awesome. I've had to read so much prescribed material for school with three college degrees and my K-12 education that I balk against doing it in my reading for pleasure. I'll take recommendations of course, but if I read something another person has suggested, I'll do it when I want to, much like Eilonwy suggesting Shadow Children several years ago and me just reading it now. I'll read what I read as it strikes my fancy, and that's okay! How do you decide what to read when? What I bought two weeks ago when I finally spent a gift card my mother-in-law gave me for Christmas last year. Score! I'm a lot like you in that I kind of just go with what I'm feeling when I choose what to read next. For the past few years I kind of go back and forth between fiction and non-fiction (though it's not a precise 1:1 ratio). Lately I've been trying to fit better into the pattern and keep a tighter ratio, but mostly because during the last General Conference I felt like I needed to focus more on reading spiritually focused books. So I go fiction - nonfiction - Church (repeat). So far so good. I still kind of fly by fancy when I'm choosing my next volume within those general genres. One thing I love about reading non-fiction is fewer people deciding they know exactly what kind of books I like to read and then telling me what to read next. I'll make that decision on my own thank you. I also think you can tell a lot about a person by what they read.